Introducing a NEW series of highly collectable products. They are mounted together with a print by the artist Darryl Legg, all-metal pilots wings finished in gold (RAF) or silver gilt (USAF and Luftwaffe) and other Special editions contain miniature gallantry medals. 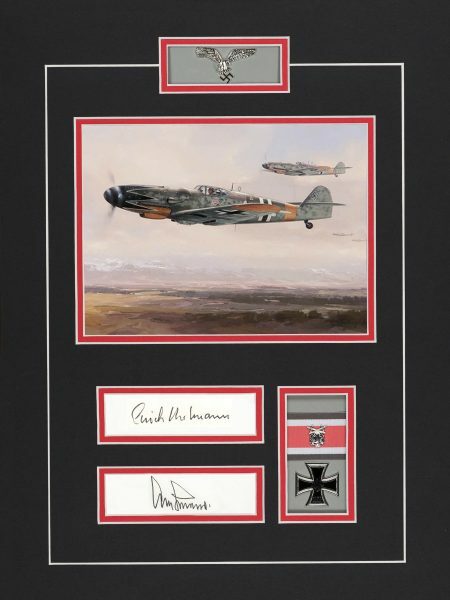 "General Adolf Galland Knights Cross, Oak Leaves, Swords & Diamonds and Oberst Erich Hartmann Knights Cross, Oak Leaves, Swords & Diamonds"
Darryl Legg’s tribute painting shows the Me 109’s of JG-52’s 4th Squadron in October 1944, as Erich Hartmann leads his fighters off a snow-covered airfield on the Russian Front. JG-52 was home to some of the most successful fighter pilots of all time. To represent one of the Luftwaffe gallantry decorations each one of these pilots received during World War Two, a miniature replica Knights Cross has been expertly mounted into the display.